Fennel in the pan » Preparation, Chop, Season, Serve, Fenchel, Pfanne » tobias cooks! I had some fennel left from the chicken dish I had prepared the other day. 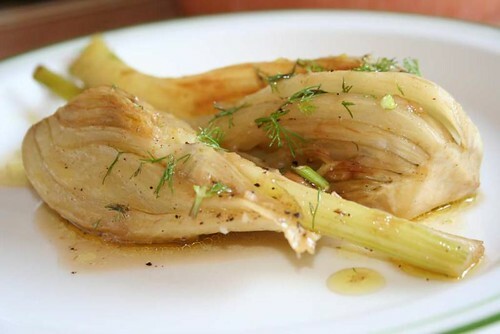 For my personal taste the best way to prepare fennel is to prepare it as simple as possible. This way it can develop its unique taste the best way possible. Wash the fennel and cut it into quarters. Cut the green sprouts off and keep them for later. Heat the oil in a frying pan and fry the fennel. Be careful the oil might spray! Fry the fennel for 15-20 minutes until it gets a nice golden colour. Do not turn the fennel too often. Add the chopped garlic and fry for an additional 3-5 minutes. Now add a small cup of water. Let the dish boil for 5 minutes until most the water has evaporated. Add some lemon juice to the dish. Season with salt and pepper. Chop the fennel greens fine and sprinkle over the dish. the german version of this recipe “Fenchel in der Pfanne” you can find here.